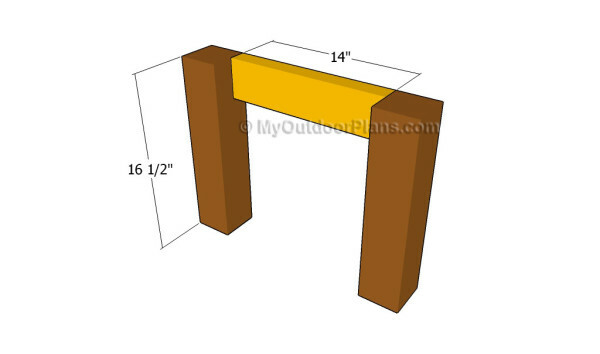 This step by step diy woodworking project is about coffee table plans. 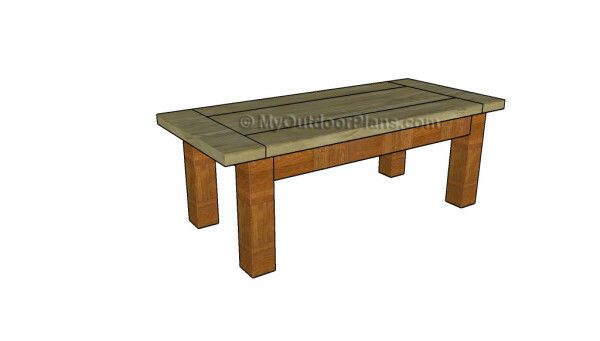 If you want to learn more about building a wooden coffee table, we recommend you to pay attention to the instruction described in the article. Work with attention and invest in high quality materials, such as pine, redwood or cedar. 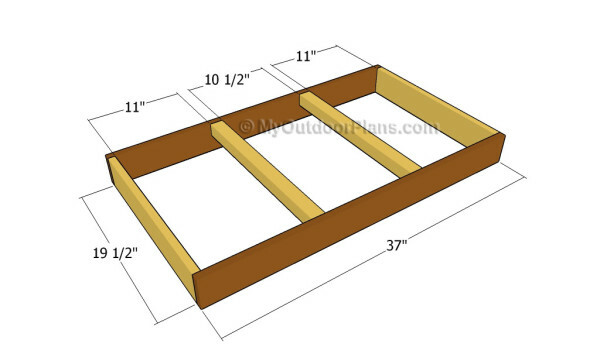 Make sure the slats are perfectly straight and in a very good visual condition, before assembling them together. 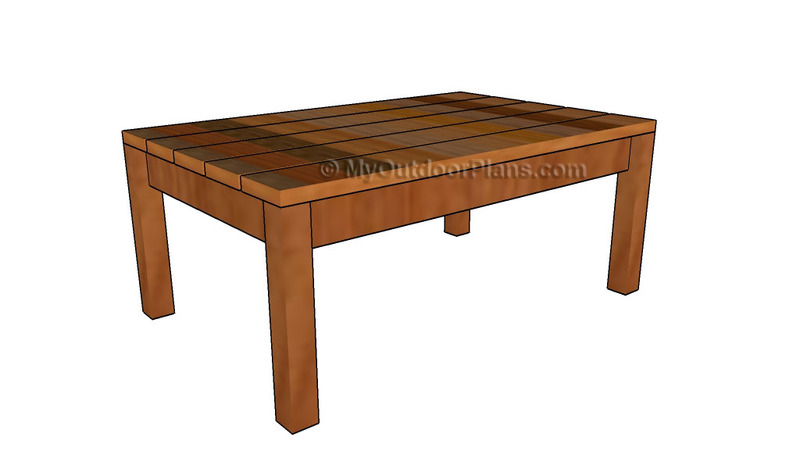 Take a look over the related furniture plans, as there are many other things that you could build for your backyard by yourself, in just a few days. Plan everything with attention and make sure you take accurate measurements, otherwise the components might not fit together properly. Always make sure the corners are right-angled before inserting the screws, otherwise the end result won’t raise up to your expectations. Make sure you follow us on Facebook to be the first that gets our latest plans and for some other exclusive content. Also, follow us on Pinterest to get many ideas for your backyard from all the internet! See how you can Support Us with no extra costs to you. 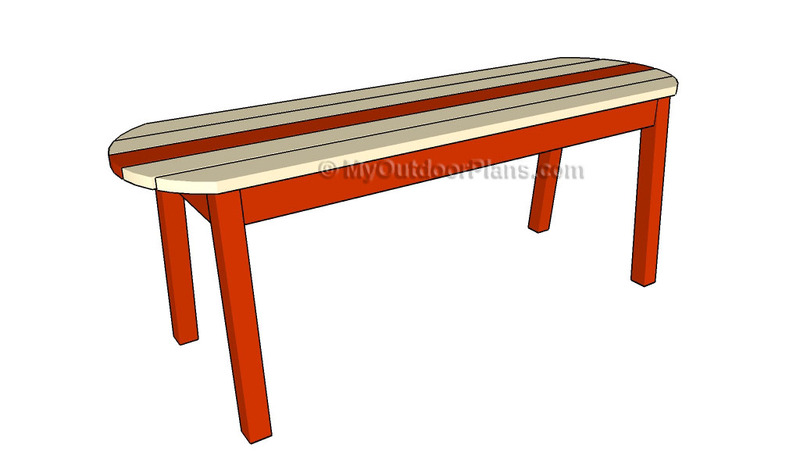 The first step of the woodworking project is to build the sides of the coffee table. As you can easily notice in the diagram, we recommend you to cut the 4×4 legs at the right size and to lock them together with 2×4 aprons. Drill pocket holes at both ends of the aprons and secure them to the legs with 2 1/2″ galvanized screws. Add waterproof glue to the joints and make sure the corners are right-angled. 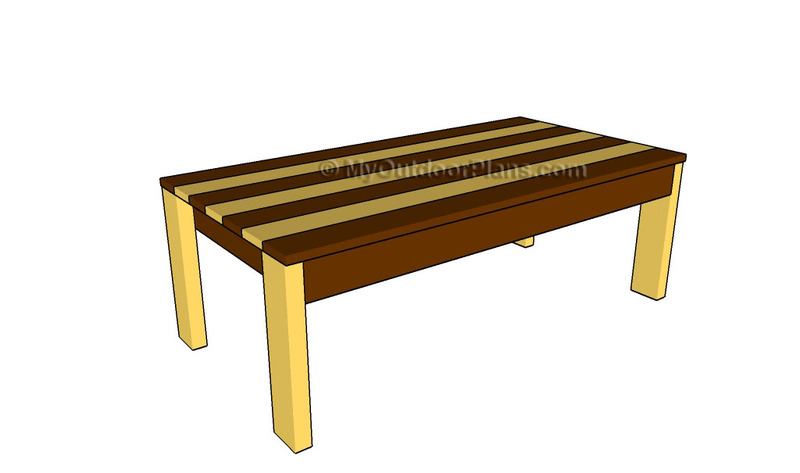 Continue the woodworking project by making the frame of the coffee table. 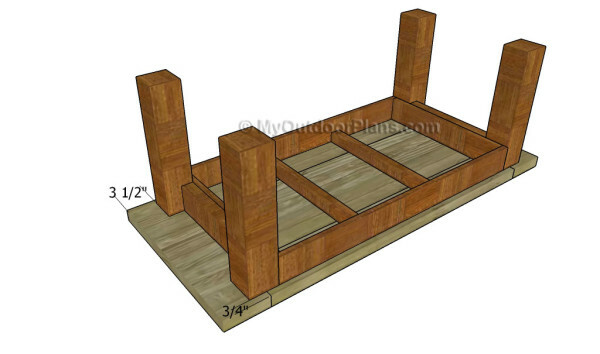 As you can see in the plans, we recommend you to build the exterior frame out of 1×4 lumber, making sure the corners are right-angled. Top Tip: Drill pocket holes at both ends of the short components and insert 1 1/4″ screws. Add waterproof glue to the joints and fit 2×2 supports to create a rigid structure. 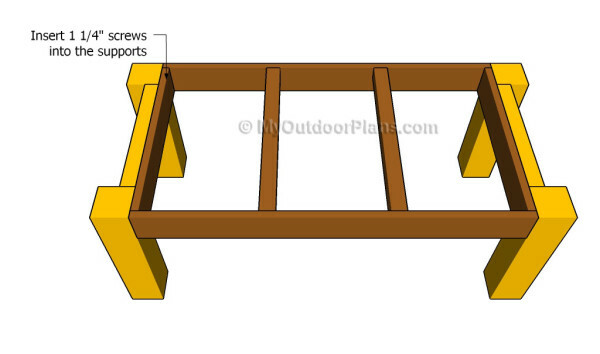 Drill pocket holes at both ends of the 2×2 supports and insert 1 1/4″ screws into the frame. Fit the frame of the tabletop between the sides of the coffee table and secure it into place with galvanized screws. Make sure the tabletop is perfectly horizontal and add waterproof glue to enhance the bond of the joints. Make sure you align the components with great care, otherwise the end result will not suit your needs. Check if the corners are square after fitting each component into place. 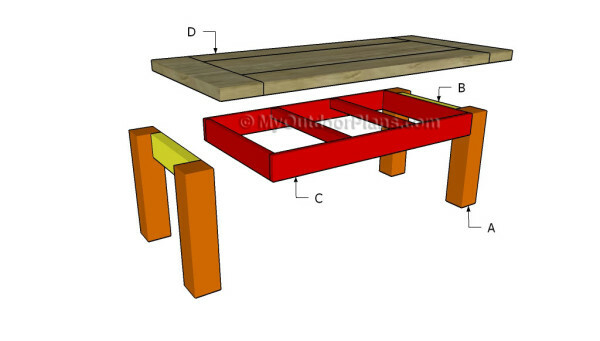 Building the tabletop of the coffee table is a straight-forward process, but you need to work with great care and to take accurate measurements before locking the components together. Drill pocket holes at both ends of the central slats and secure them to the end components. In addition, you could also secure the long slats together by drilling pocket holes along the edges and inserting screws. Add waterproof glue to the joints. Center the frame of the coffee table to the tabletop and secure it into place with galvanized screws. Drill pocket holes through the aprons and insert appropriate screws into the tabletop slats. If you want to enhance the rigidity of the structure, we recommend you to add waterproof glue to the joints. Align everything with attention before inserting the screws, as the symmetry is essential for your project. Top Tip: If you want to enhance the look of the woodworking project and to protect the bar from decay, we recommend you to cover the components with paint or stain. Place the coffee table in a proper location and move it whenever necessary. 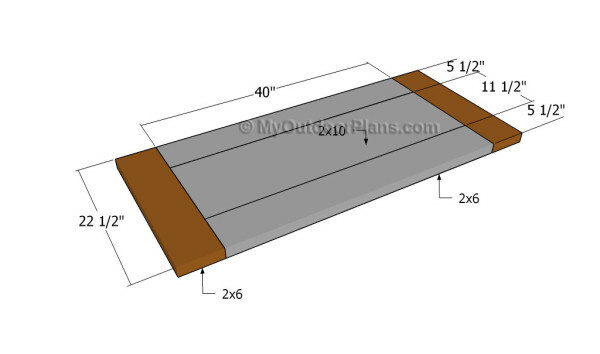 This woodworking project was about coffee table plans. If you want to see more outdoor plans, we recommend you to check out the rest of our step by step projects. LIKE us on Facebook and Google + to be the first that gets out latest projects.